This is so fabulous!! What a beautiful image!! I love how you've framed it with the black and gold die!! So gorgeous!! Thanks so much for playing along at Scrapy Land!! Gorgeous card as always Connie, love the image and beautiful colour scheme you have used. 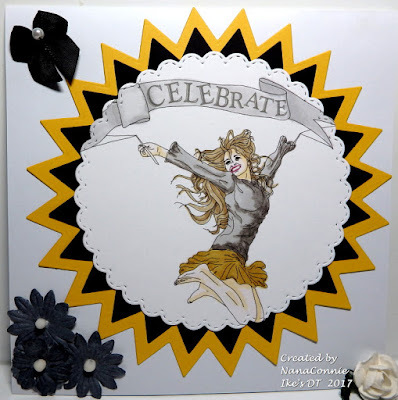 What a SUPER card, perfect for a celebration, love the die surround, a Fabulous card my Friend. WoWza !! This knocks my socks off !!! Awesome colouring and such a stunning colour combo. An amazing creation :-D Thank you so much for making this for me at IWC. Fabulous card! Love the dies you used and the colours really pop! I have never seen a die with scallops and stitching, so cute. Thanks so much for joining us at As you like it! Fab 'wow' card! I love my stitched dies too. They've only been around a while, but there are so many different varieties now. What would we do without them!